THE publication of files belonging to one of Hollywood’s most notorious private detectives has shed new light on the 1962 death of Marilyn Monroe and her relationships with John F Kennedy, then the president of the United States, and Bobby, his younger brother. More than half a century after Monroe’s apparent suicide, a startling account of her last day alive has emerged from the notes of Fred Otash, who had installed bugging devices in her Los Angeles home. “I listened to Marilyn Monroe die,” Otash claims in the notes recovered from a suburban storage unit by his daughter Colleen more than a decade after his death. Files shedding new light on Marilyn Monroe’s last night alive and her relationships with President John F Kennedy and his younger brother Bobby have emerged 51 years after her death. Documents belonging to the late Fred Otash, one of Hollywood’s most notorious private detectives, were uncovered by his daughter Colleen after being found in a suburban storage unit. According to Otash, who died in 1992, Monroe had a relationship with the brothers and complained about being ‘passed around like a piece of meat’. 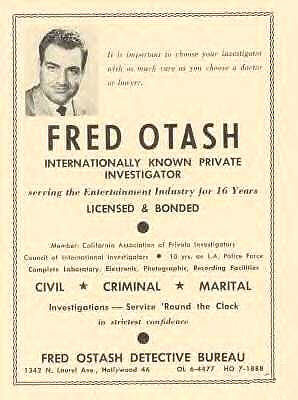 Fred Otash (January 7, 1922 – October 5, 1992) was a Hollywood police officer, private investigator, and author. Otash worked for Hollywood Research Incorporated, which did business with the magazine Confidential He is also known for being hired by Peter Lawford to investigate the death of Marilyn Monroe. Otash died at the age of 70 on October 5, 1992. He wrote about his life in his memoir, Investigation Hollywood: Memoirs Of Hollywood’s Top Private Detective. He recorded that on August 5 1962, she had a violent argument with the Kennedys and that she felt that she had been ‘passed around like a piece of meat’. The notes read: ‘She was really screaming and they were trying to quiet her down. Otash claimed he had listened to Marilyn Monroe die after he had taped an argument she had with Robert Kennedy and Peter Lawford. “She said she was passed around like a piece of meat. It was a violent argument about their relationship and the commitment and promises he made to her.